After partition the biggest problem faced by Sindhis in India was of re-settlement, which they overcame with hard work and willpower. Be it Education, Healthcare, Industry, Trade etc. they have carved a niche for themselves in every field. The two areas in which Sindhis have lagged behind are politics and media. Representatives of other communities are elected from their respective states and reach Assembly and Parliament and raise their voice against the problems faced by their communities. The minority communities which do not have a state of their own have been granted reservations by the Government. Unfortunately, we neither have a state nor reservations. Therefore the needs and problems of our community are never raised in the Parliament. We however have two towering Sindhi personalities, who on their own merit have achieved a phenomenal place in Indian Politics - L. K. Advani and Ram Jethmalani. They are regarded as National Leaders by people of our country and as such Sindhi is regarded just like any other community of this country by them. The other sector in which we are weak is Media, be it print media or the electronic media. It is utmost necessary for Sindhis to take greater interest in this field. Spread all over India we do not have a unified voice because of this lack of presence in the media sector. Media can also unite our community. Today is the era of mass-media which includes newspapers, magazines, radio, films, T.V. channels etc. Today, Sindhis who are scattered all over the world can come together with the help of media. The news about Sindhis in one state can be disseminated to the Sindhis of other states. Not only this, the electronic media can infuse new life into our language and revive it, specially in the case of youth born in India or abroad, who are not familiar with Sindhi language. Today we need powerful Sindhi newspapers and Sindhi T.V. channels through which our voice can reach Parliament. Media can not only transmit our voice to the Parliament but also play an important role in strengthening our literature. Today, times have changed. In the days gone by, battles were fought using weapons. But nowadays along with the armed forces the strength of media is also necessary. Partition separated us from each other and if we want to unite we will have to work hard through the media. Today in our rich and ancient community a very small beginning is observed and we in our own small way are trying to make our contribution through the publication of Sindhishaan. We have also taken the advantage of internet and hosted our website www.sindhishaan.com as well as a community newsletter ‘Prerna’ and been trying to reach the Sindhi community all over the world. So its high time we awaken. We have settled ourselves financially, now we need the media for our rights and the redressal of our problems. 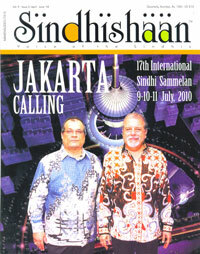 My friends, today it has been 17 years since we have been organizing these Sammelans on an International level from U.S.A. to London to Bombay to Singapore and now in Jakarta, but only about 1000 – 2000 Sindhis participate in these Sammelans. If we had the power of media and satellite channels then this information could have been broadcast to Sindhis all over the world and then maybe there would be much more participation in planning for the future progress of our community.